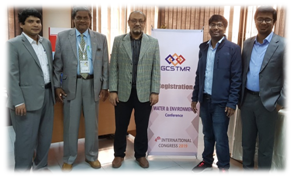 The Department of Civil Engineering, BUET organized three conferences jointly with Global Circle for Scientific, Technological and Management Research, (GCSTMR) of Australia held on 19 – 22 January, 2019. The conferences are 2nd International Conference on Water and Environmental Engineering (iCWEE 2019), 2nd International Conference on Structural Engineering and Research (iCSER 2019), and 2nd International Conference on Engineering Research and Practice (iCERP2019). The technical sessions held at BUET Campus on 21 and 22 January 2019. Approximately 100 papers were presented in the technical sessions, held in parallel at 5 venues. There were over 120 participants registered in these conferences, including international participants. Thirteen renowned national and international speakers presented their keynote speeches at the conferences. On 22 January the conferences end with a closing ceremony presided over by Professor Dr. Ataur Rahman, Western Sydney University, Australia and Professor Dr. AhsanulKabir, Department of Civil Engineering, BUET, Dhaka. The reviewer selected best papers in student and non-student category for award.